Welcome to Tomcat's Lair! This site is the unofficial home of the mighty Grumman F-14 Tomcat -- despite its age, it is still arguably one of the most formidable military aircraft in service today. It combines lethal firepower, good agility, and versatility into one beautiful airframe. No, this is NOT another one of those run-of-the-mill military aircraft web pages with nothing more than some hastily slapped together technical data and a few thrown-in pictures. 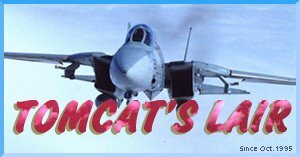 In here you will find detailed aircraft history, information and just about everything else you'd ever want to know about the Tomcat. Whether you are an F-14 aficionado or a military aircraft enthusiast, this is the place to be. Internet Explorer 3.0+ or Navigator 3.0+ recommended. Denotes the material that have been added or updated on Octobert 17th, 1996. Get your copy of the beautiful 1997 Air Power Calendar! Introduction to the F-14 Tomcat. An overview on the development history of the aircraft. The prototype aircraft and their assigned duties. Notable events in Tomcat's service career. The evolution of the big 'Cat -- from F-14A to F-14D. The ferocious feline shows its teeth. Current status of US Navy's F-14 squadrons. Squadron histories of US Navy Tomcat operators. Notable quotes related to the aircraft. A day-time carrier qualification mission. 1996 military teams airshow schedule. Links to other worthy sites on the Internet. Tomcat's Lair is maintained by James C. Kao ([email protected]). The contents of this site will be updated on a regular basis. Any suggestions, criticisms, or comments are welcome . If you have any information on the Tomcat that you'd like to share, or if you have noticed any inaccuracy on the information presented here, by all means, give me a holler!